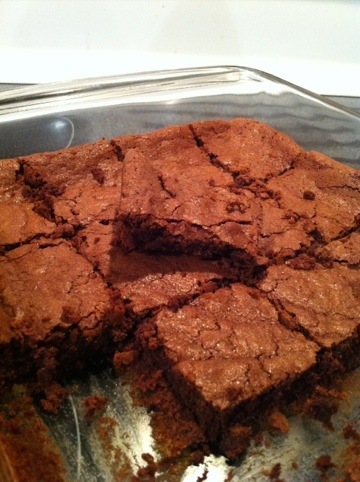 These are my favorite brownies and now that I’m feeling well after an icky cold I just had to make some. They take less than an hour from start to finish so they’re perfect for mid-week craving. The best part: the book the recipe comes from. One of those beautifully yellowed, well worn cookbooks from the ’70’s (1979). Isn’t that a pretty sight? 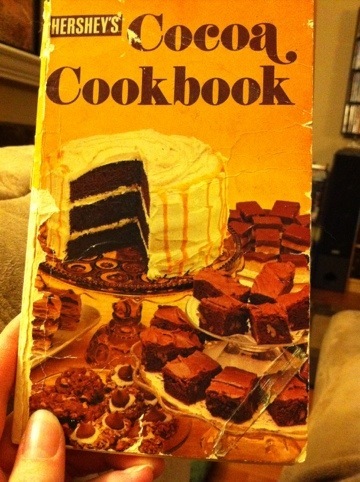 If you gave this book turn to page 50 and use the Chocolate Brownie recipe there. Beat the eggs in a mixer and gradually add sugar and vanilla. Mix in butter. Add dry ingredients gradually until well blended. Stir in nuts of you choose to. Spread mix into an 8 inch square pan and bake for about 30 minutes in a 350 oven. They’re done when they start to pull away from the edges of the pan. That will give a perfectly chewy, chocolatelty, delicious brownie. Cool for about 10 minutes for warm brownies or longer for firmer ones. Dust with powdered sugar and gobble ’em up! Categories: Baking, Delectable Dabbling, Food, Sweets | Tags: chocolate, Easy bake | Permalink.